I've been playing Transport Tycoon for a very long time. It's a simulation game involving transporting goods and passengers — the kind of game I love, and once wanted to write. I started playing again early this year, with OpenTTD (an open source “clone” of the game), and then got interested again once I tried their nightly builds with lots of new features. The weird thing about Transport Tycoon is that the original game didn't keep my interest. The AI was horrible, and the game balance didn't work for me. It was too hard at the beginning of the game and then once you had enough money, the game was too easy. Instead, what I and others have done is come up with our own game goals, treating it more as a “software toy” than a game. In some games I avoid making any changes to the terrain; I work within its constraints to create “natural” looking routes. Other times I challenge myself to connect every city, or handle all resources of a certain type. One of my favorites is designing high capacity routes and stations. I once built a custom scenario with around 100 coal mines and a single power station, and then designed routes that could handle all the coal. 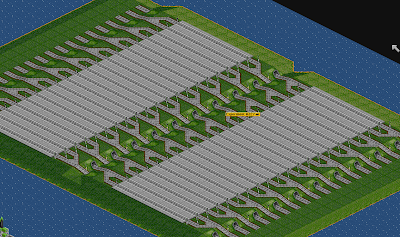 OpenTTD opens up new design possibilities, with changes to track building, station size and shape, and routing algorithms (see pre-signals and advanced signals). To increase the space I have available for coal mines, I built tunnels underneath some open space, where I'll place mines. The concrete tiles to the northeast of the station are considered station platforms, and extend the “reach” of the station. Using those as tendrils I can make the station area larger, and place more coal mines within its reach. On the other end of the line is a large station next to a power plant; all the trains go from here (and similar coal stations) to that power plant. You can see to the lower left that there are many tracks to handle the trains, plus extra space where I'll add more tracks after I add coal mines. The challenges here are keeping the trains running, dealing with breakdowns, handling the capacity, and making a nice layout. It looks like two stations but it's actually one. I built a longer one, then removed the tracks in the middle. The station fits into a 20x20 space, but can handle 40 trains. As shown all the trains come in from the southeast, but it's also possible to use this station with 20 tracks handling northern traffic and 20 for southern traffic, either as a through station or as a terminal. The gap between the two blocks has to be 6 tiles, so there are 14 tiles left, meaning the trains can be at most 7 tiles (14 cars) long. I haven't actually used this station anywhere, but with the tunnels at the ends, it could be quite useful for tunneling underneath a major city. There are lots more interesting layouts for stations and tracks. Take a look at this guide and this forum post for some examples. You can do a lot with the three signal types (each having their own algorithms); the routing is the most fascinating part of this game. This experimental station is an example of the weird things you can express with advanced use of pre-signals. 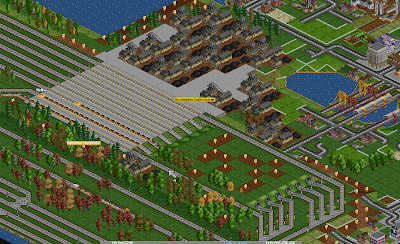 As OpenTTD adds more features, it opens up new possibilities for layout and routing. Coming soon are building tracks on slopes (allows more compact layouts), new road stations, trams, one-way roads, new airports, new types of cargo, new scheduling options, and new signal algorithms. It's not a game for everyone, but it's definitely a game for me.